Oh, my sweet girl. One year ago today you came into this world, and into our lives. It has been a wild and wonderful ride so far, and I’ve treasured every moment. Twelve hours blurred by, and then here you were! Tiny, red, wrinkly, and perfect. You cried at first, and then settled in for a snuggle. Daddy held you first, and then me, and the world around us ceased to exist for a while. Being at the hospital was exhausting, but we got you back up to a good weight (a recurring theme…), and they let us take you home. The doggies got to meet you for the first time, and they were curious and unsure. We settled in at home and the fun began! Just like our stay at the hospital, the year has somehow slipped by. We’ve watched you with love and given you encouragement as you’ve worked toward your milestones – lifting your head (boy, did you HATE tummy time! 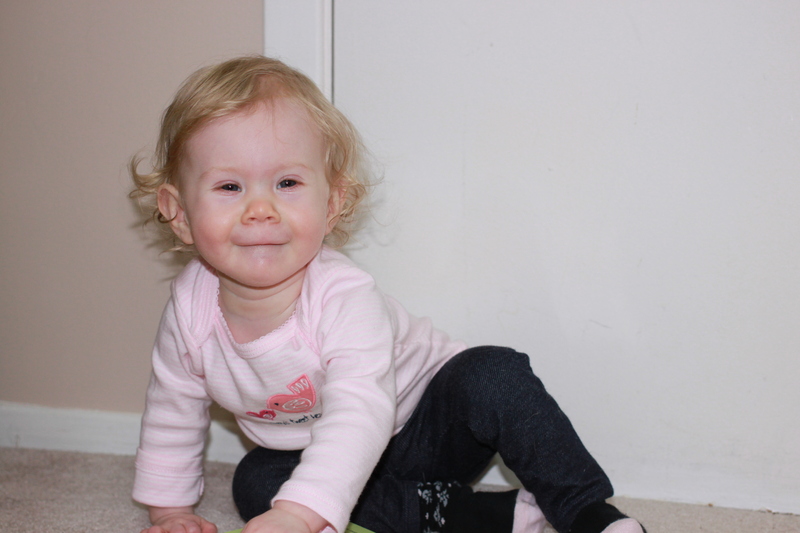 ), rolling over, sitting up, crawling, and then cruising. You’ve met lots of people, visiting family and making friends at play groups, charming everyone with your sweet smile and sparkling eyes. You’ve travelled as far as Perth, to your grandparents’ place, and to Gracefield, Quebec, to visit some extended family. We’ve had our struggles, too. You’re getting taller but you don’t seem to put on a lot of weight, and that’s been a source of frustration. I’ve nursed you, we’ve given you formula at different concentrations, and you’ve seen 5 different doctors and dietitians, including a gastrointestinal specialist. You’ve been poked and prodded, we’ve tried different things, and everyone seems to have come to the same conclusion – you’re just wee, and that’s how you are. You’re a bit of a picky eater, but we do our best to make sure you get good, homemade meals and that you get the nutrition you need to keep growing, even if it’s at your own pace. You, my dear, have been a delight. You’re amazingly even-tempered. You take most things in stride, though you’re not fond of loud, startling noises. You love watching other children and are very sociable, as long as nobody tries to pick you up. You’d rather explore than snuggle, and that’s alright. I love watching as you discover and start to understand the world around you and how it works. You’re a year old today, little bean. Happy birthday. We love you more than you can possibly imagine. This entry was posted in Dear A and tagged babys first year, happy first birthday, new years eve on December 31, 2013 by lovelaughlaundry.